Staff Sgt. Sal Giunta – “average soldier” — That’s a GOOD thing!! Tonight I watched the repeat of the “60 Minutes” story of Staff Sgt. 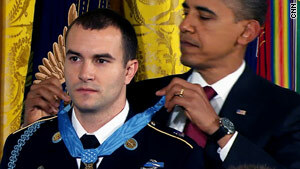 Giunta, who won the Medal of Honor for actions he took during an ambush of his squad in Afghanistan. Sgt. Giunta advanced on, and shot at enemy soldiers who had captured a severely wounded U.S. soldier, Sgt. Joshua Brennan, and forced the enemy to release Sgt. Brennan and flee. Sgt. Brennan lost his life later that day during surgery to repair his wounds; Sgt. Brennan and Sgt. Giunta were good friends. So did Specialist Hugo Mendoza, the team’s medic who was killed in the first moments of the ambush; Franklin Eckrode survived his wounds, and Gallardo was awarded the Silver Star for his actions that night. Giunta is not yet able to reconcile their losses with becoming an American hero. “I’m not at peace with that at all. And coming and talking about it and people wanting to shake my hand because of it, it hurts me because it’s not what I want. And to be with so many people doing so much stuff and then to be singled out – and put forward. I mean, everyone did something. Okay, someone wrote about this, and then someone else approved it. And then a story was told and handshakes were made, and then sooner or later, I’m talkin’ to the president of the United States. I don’t see how that happened,” he told Logan. Like it or not, Giunta is now part of an elite fraternity: there are only 86 Medal of Honor recipients alive today. For the rest of his life he’ll enjoy certain privileges, like a guaranteed seat at presidential inaugurations, and he’ll be honored at military events. But it’s something he may never be comfortable with. Ira Hayes was arrested numerous times for public drunkenness and died after a night of drinking in January 1954. His exhibition as a hero was not the reason for his early death, but most stories mention it as a factor in his inability to make a healthy adjustment to civilian life. I believe him; and I strongly disagree with him. His error is thinking that those who died during the battle were more deserving than he – because they “gave all”. Sgt. Giunta, they did give all, BUT none of you knew who was going to live and who was going to die that day, and your actions should not be judged by whether you survived or died. They would have wanted to survive while fighting their battle, and you would have been willing to die while fighting that same battle – THAT is the heroism that we honor, NOT the deaths of young men who should still be alive. All of you, just as you say, “did what needed to be done…” I am grieved that some lost their valuable lives doing their job, but I am glad that some survived. “Survivor guilt” is real, and deserves intervention. I want you to live the rest of your alloted years being the same strong, steadfast leader who took the action “that needed to be done”, and never doubt the strength, the valor, the importance of “simply” doing the job. Look around, Sgt. Giunta – there are lots of men and women who do NOT do what needs to be done each day – with their children, with their marriage vows, with their neighbors, with their friends, with their constituents, with their customers, with their employees or co-workers. Do not discount, do not dismiss, do not de-value the importance of “doing what needs to be done”. This has always been the line between winning and losing – in combat, in business, in family duties, in relationships, in LIFE. I believe that other men in your unit WOULD have done what you did if they were in your position, and I commend all soldiers who would have fought to save Sgt. Brennan (and those others who DID) and all the others who have been injured in battle. But YOU were in THAT spot, during THAT ambush, and YOU took actions that succeeded in recovering your buddy from the hands of the enemy. It was not necessary, or desirable, that you DIE while taking that action for it to be considered brave, or honorable, or deserving of our thanks and praise. It is true that we should not shower only you with honor and praise; it should be shared with all other soldiers who also have shown their dedication to duty and to their “brothers”. We admire you for your willingness to admit that you had been “an average soldier” – but that does not reduce our admiration for you. It simply means that when “grading” our soldiers for fortitude, bravery, ability to get the job done – that “average” does NOT mean a “C” grade; our average soldiers must be Grade AA ! !